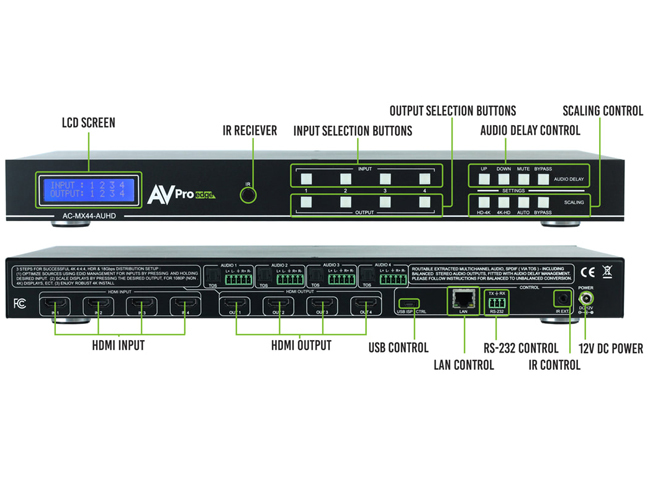 AVPro Edge AC-MX44-AUHD 18Gbps True 4K/60 AUHD 4x4 Matrix Switch is a true 4x4 HDMI matrix switch. Supporting HDMI 2.0(a/b), HDCP 2.2, up to 4K video resolution, and up to 18 Gbps bandwidth. This switch allows any source (Blu-ray, UHD Blu-ray, satellite receiver, game consoles, PCs, etc) to be shown on any of the connected displays. This matrix equalizes and amplifies the output to ensure the HDMI signal can be transmitted through long HDMI cables without loss of quality. HDBaseT Compatibility Mode (HDBT-C) : This EXCLUSIVE AVProConnect technology allows you to convert high bandwidth signals that are between 9 Gbps - 18Gbps like UHD Players, HDR Content, Gaming Systems, PC's, and Media Players. The conversion uses a proprietary algorithm that impacts the original image a little as possible so you can transmit your HDR and high bandwidth signals over long distance transmission devices like HDBaseT Extenders (AC-EX70-UHD) or use a display that does not support 18G. Best of all, this is managed on a per output basis so you have complete control over what individual runs are "down-clocked"
4K Up/Down Scaling : This technology is managed on each output. This will allow you to upscale 1080p sources to 4K (With Image Enhancement), or downscale 4K sources to individual outputs that may not support 4K to 1080p. This completely eliminates the problem that all other matrices have that forces them to "dumb down" the entire system even if there is only 1 old 1080P display. Audio Delay : With the AC-MX44-AUHD you can manage audio delay on the balanced or digital outputs per output. This features up to 630ms of delay so your lip sync problems simply vanish. Audio delay can be managed directly from the front panel for ease of use and simple setup with the push of a button. Control - Matrix switches are generally controlled via 3rd party controller like Control 4, RTI, Crestron and others. Many integrators want ready made drivers for their control system to make programming and deployment easier. Who uses them? 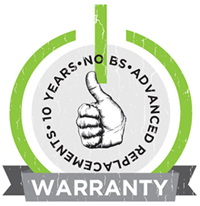 - At the heart of almost every custom install is a matrix switch to ease routing and distribution of signals throughout the install including Audio, Video and Control - so, you have a product that can compete on price, performance, compatibility, and control. Matrix Switches are used widely in both Commercial and Residential Applications. Driver SupportfFor Crestron, C4, RTI, ELAN and more!!! Why not buy this AVPro Edge AC-MX44-AUHD 18Gbps True 4K/60 AUHD 4x4 Matrix Switch today?